Bellingham hosts a thriving community of artists, and those who live here, have likely seen the artwork of James R. Williamson gracing the walls of numerous local establishments. 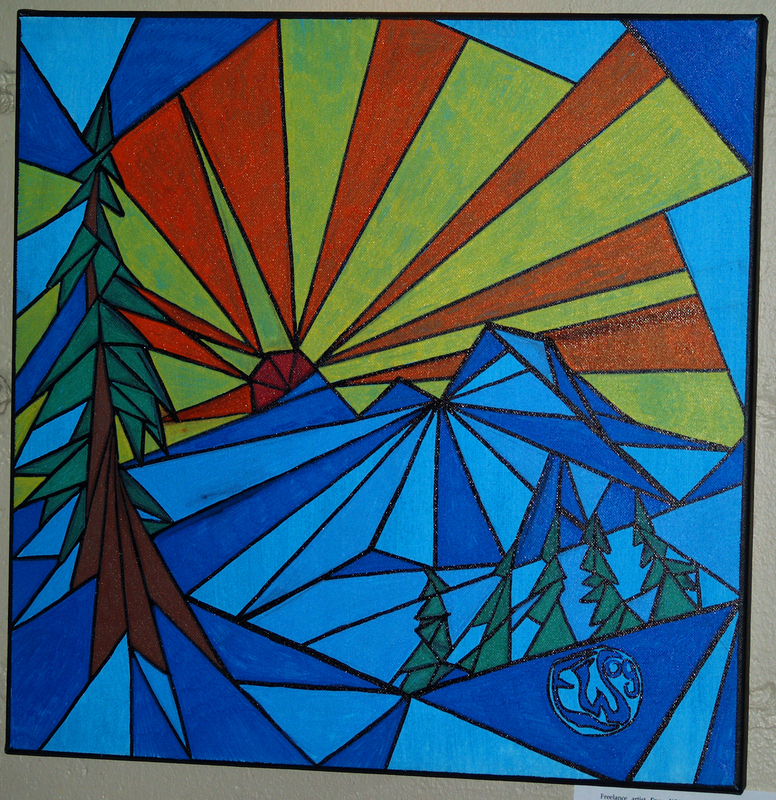 His work has generated a unique “style” of Pacific Northwest Art. 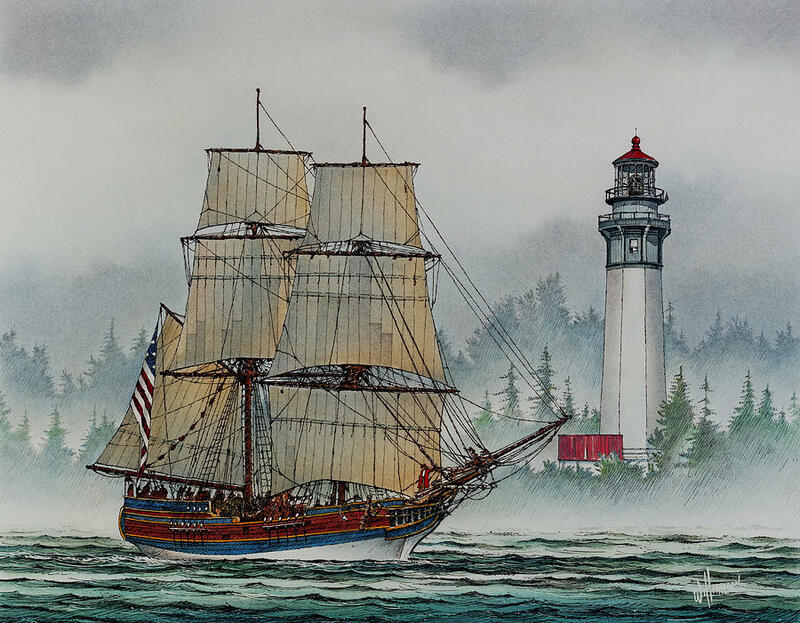 The name Williamson has become synonymous with images epitomizing PNW landscapes, wildlife, but most notably, maritime subjects. 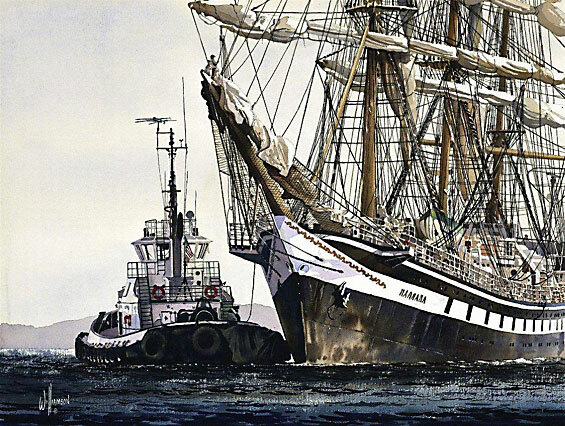 A U.S. Air Force Veteran of the Strategic Air Command, his passion and dedication to this particular line of work has inspired many of his Maritime paintings of military ships, workboats lighthouses etc. His striking and memorable images embody an exceptional degree of clarity and emotion, shaping a new genre of PNW art that has attracted numerous clienteles. Williamson’s originals and limited editions hang in thousands of executive offices, boardrooms, bank lobbies, government buildings, restaurants and private residences throughout the United States and in several other countries. A longtime Bellingham resident and fellow Western Washington Graduate (1978), Williamson is considered an established local figure around town. Displaying original paintings and limited editions of maritime, landscapes and wildlife subjects. Contact the artist for current print information including remarqued prints (with original drawings in the margin), giclee editions (digital prints) and original works in progress. Displays orginal paintings by James R. Williamson plus limited editions of Pacific Northwest subjects framed and unframed. Watercolor class taught by Williamson on Wednesday evenings. Call for information. Local Brewery Loves Local Art! We love being a small, independently owned craft brewery that focuses our efforts on the local scene. We brew all of our beer here in-house, do our own delivery and distribute our beer primarily to local bars, bottle shops, grocery stores and restaurants. We think it’s important to invest ourselves in the local community and economy in every way we can. One of our favorite ways to do this is to support local artists with art shows in our bistro. Currently, up on display, here at Boundary Bay Brewery we’ve got art from a long time Bellingham favorite: Steeb Russell. Steeb is a self taught artist who has been drawing characters since he was a child. He lives in Bellingham and says he’s inspired by friends, colors, coffee, his skateboard, laughing, stories, art, good food, his bicycle & the marvels and mysteries of our animal world. We love seeing Steeb and his art around town – and we’re honored to have it grace our brewery for the time being. Stop in before the end of September to check out his fun, playful paintings and check out more of his work at his online gallery. We’re a craft brewery, so we always enjoy supporting other people’s crafts too. If you’re a local artist interested in showing your work here at Boundary Bay Brewery, please email our General Manager Janet Lightner (genmgr@bbaybrewery.com) with your information and a few samples of your work. We have a big space, so we’re particularly interested in LARGE pieces of artwork! At Boundary Bay Brewery we believe in food experiences. We believe that it’s about the whole package…not just what’s on your plate. So, we’ve made it our mission to make your Boundary Bay experience a multi-faceted affair bringing together good food, great beer and community events. One of the ways we’ve found to support our community is to bring local artists and musicians into our brewery to expose the public to their work and to provide a space for them to showcase what they do. This month, we are quite lucky to currently be showing the FIRST gallery show Evan Whitehead has ever done. Yes, looking at his work, we too find that hard to believe! 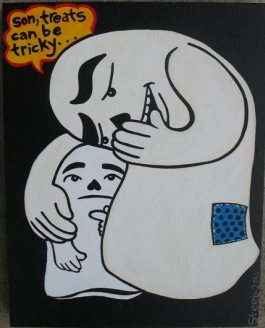 But, it’s true…this great Northwest artist has been hiding his love away! 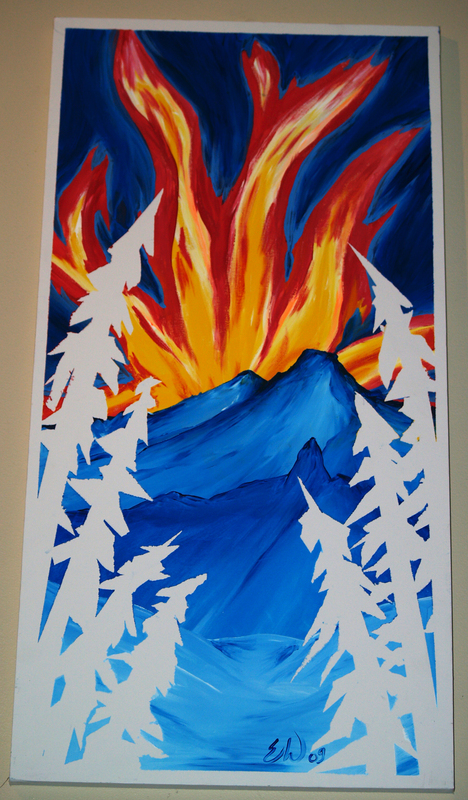 But the secret’s out now…and Evan’s work is fully on display right here in the Bistro at Boundary Bay Brewery. Freelance artist, Evan Whitehead, is native to Bellingham and grew up in the foothills of the North Cascade Range. Evan has long called Bellingham his home and Mt. Baker his backyard and feels fortunate to have grown up in this place of natural beauty and inspiration. Being a natural explorer, hiker and avid snowboarder, Evan decided to focus his art on the natural presence of Mt. Baker’s beauty and individualism. He has managed to portray the mountain in many stages of beauty and in all kinds of light – all rendered in acrylic on a variety of surfaces including wood, canvas and rocks. Come check out Evan Whitehead’s work and revel in the beauty of this incredible place we live in! If you love the outdoors, if you snowboard, if you love local art…heck, if you just love beer and need something to look at while you drink…come down here and check out this awesome art!! Cheers. And if you like what you see, contact Evan at evanwhitehead@yahoo.com (36)303-1794. Join us for the opening reception of Harvest on Saturday, November 21st from 10am-11am at Boundary Bay Brewery. Find a great gift for the locavore or art lover in your life-perfect for the holidays. This is an art show you can feel good about…a local artist, celebrating the local agriculture of our region, showcased in your local brewery: Boundary Bay! Complimentary coffee and baked goods, too! Erica Epperson‘s show, Harvest, celebrates the relationship between locavores and the land that feeds them. She works in both acyrlics and oils to capture the beauty of everyday life as well as to honor the connection between people and the sustenance that the earth provides for them. Epperson relies heavily on photographs she takes of food she has grown and eaten herself. From running a sign-making business to mural painting to opening a tattoo studio, Erica Epperson is a self-taught artist who has had art as a consistent theme in her life. Her painting style shows definite influences from both art deco painters and WPA murals. She now finds rich inspiration from Bellingham, which she currently calls home. 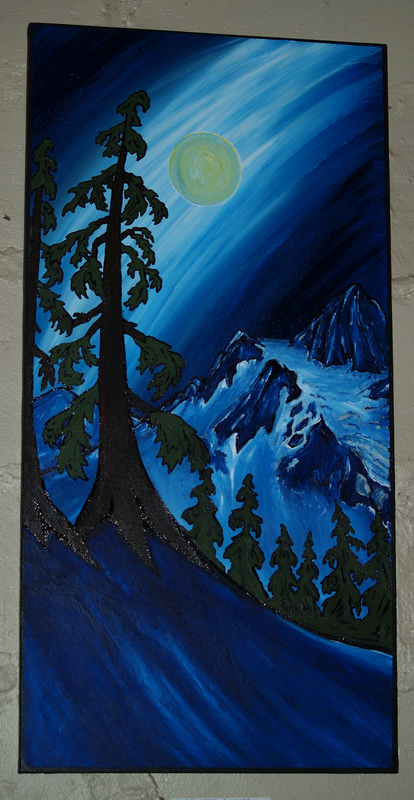 View oil and acrylic works by local artist Erica Epperson at Boundary Bay Brewery from November 15th through January 1st. Inside Boundary Bay Brewery, we are blessed with cinderblock walls perfect for art installations. We rotate exhibits through our gallery/restaurant and have featured many wonderful local and regional artists. Currently, our walls are adorned with the creations of Donna Washington. Donna’s work incorporates her extensive background in art along with the natural beauty of her surroundings and her love of people watching. She has painted on paper, canvas and terracotta using a variety of mediums including watercolor, India Ink, acrylic and oil. Donna has a studio right here in Bellingham, WA and you can contact her directly to discuss commissioning a painting of your family, loved one or children. Come down to the brewery to see Donna’s work up close! Best of all, should you decide to purchase one of her incredible paintings, half of the money will go to a relief fund of your choice or a specified nonprofit (such as the Orphanage Uganda). This is a great opportunity to support local artists and to help nonprofits – not to mention beef up your art collection! So, if you don’t already know, Bellingham is a community that deeply values artists and their art. The artists may make their living that way, but more than likely, they bring home the bacon some other way and create on their down time. And, like most people in Bellingham, Boundary Bay Brewery is full of artists. Most of the time, our tap room and dining room is also utilized as a gallery space for local artists, but this time we decided to have an employee art show! We’re calling it “Don’t Quit Your Day Job!” Don’t be fooled though…this artwork is seriously good. 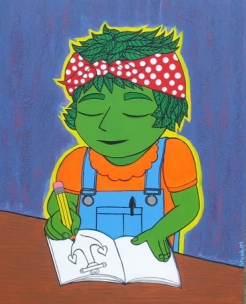 Some of our employees just might be able to quit their day jobs and pursue art full time. Especially with your help! 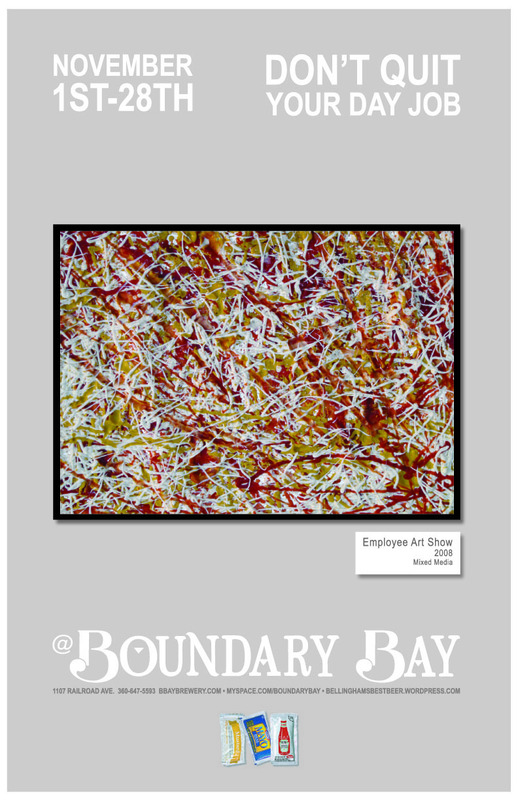 Come in between November 1st and November 28th to see the many talents of Boundary Bay employees and maybe even purchase one of our pieces to add to your own art collection. We already know you like our food and you love our beer…so come in now and find out if you love our art too! Expect to see lots of great photography, some incredible paintings, and even some mixed media.